A distributor consists of a rotating arm or rotor inside the distributor cap, on top of the distributor shaft, but insulated from it and the body of the vehicle (ground). The metal part of the rotor contacts the high voltage cable from the ignition coil via a spring-loaded carbon brush on the underside of the distributor cap. The metal part of the rotor arm passes close to (but does not touch) the output contacts which connect via high tension leads to the spark plug of each cylinder. As the rotor spins within the distributor, electric current is able to jump the small gaps created between the rotor arm and the contacts due to the high voltage created by the ignition coil. The rotor arm can be a weak part of your ignition due to the stresses it suffers in daily operation. Over time, materials can degrade and corrosion can cause your spark to weaken. 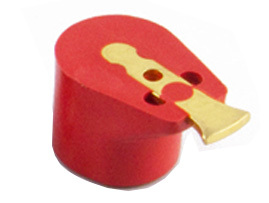 The Powermax red rotor arm uses a ‘moulded in’ brass conductor and does away with the riveted old style conductor. The body is moulded using the latest materials and production machinery to close tolerances improving the fit and durability of the rotor arm, and is suitable for high voltage coils and electronic ignitions. A rotor arm that utilises Powermax Technology will give better performance and more reliable, accurate spark control at high rpm. 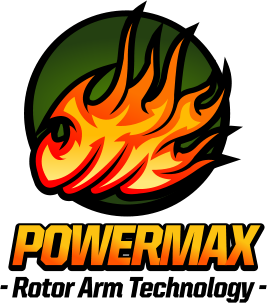 The Powermax rotor arm is a essential for the discerning enthusiast who understands the shortcomings of the old fashioned ignition technology. As you can see our Powermax Red Rotor Arm is made from a higher grade composite, is moulded to ensure that durability & performance is paramount.